After a year-long closure, the library opened its doors to a multitude of new features installed over the library’s two floors. 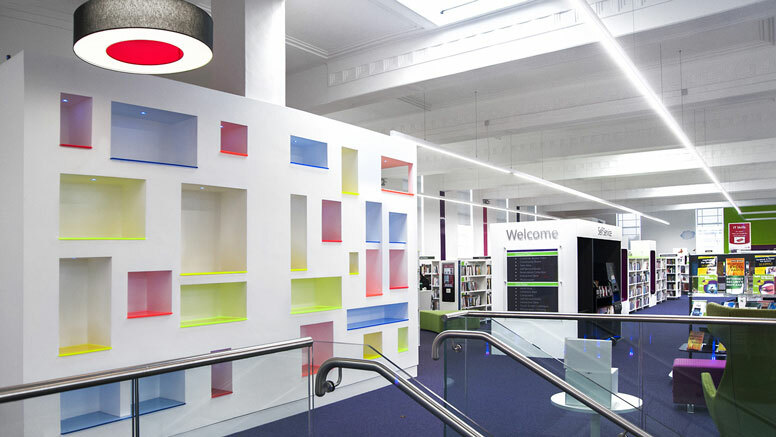 The library now includes interactive tables, a gadget bar with internet access, electronic noticeboards and digital end-panels as well as a children’s section, teenage area and a community room. People visit the library for a variety of reasons: to use the computers, read newspapers and magazines and find books of course! The new library has proved a valued facility within the community, designed to suit users of all ages and interests and provide a warm welcome to every user. The children’s area makes a visual impact with stunning wall graphics that extend to the furniture. A stage has been fitted and surrounded with integrated brightly coloured kinderboxes, allowing kids to browse through the books with ease. Continuing the digital theme, an interactive big screen has also been installed. The library is now open 7 days a week and is certainly worthy of the flagship status it has been awarded.